Samsung Galaxy Note 8 launch event took place on August 23, 2017. Samsung has been giving a tough competition to Apple’s iPads with its tablets ever since the first one was launched. It makes sense that Samsung is trying to compete with Apple’s iPad series (iPads and iPad Minis) with so many Galaxy Note and Galaxy Tab variants. 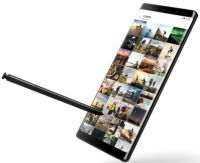 The Samsung Galaxy Note 8 is another one in the series that shows that Samsung wants to win the tablet game, but not with a full sized device. Here, Samsung to deliver a phablet (somewhere between a phone and a tablet), with the S-pen enabled Galaxy Note series. The next device in line is the Samsung Galaxy Note 8. The Note 8 surely is a great device launched by Samsung. Let us take a deeper look at it, and see what is so special about it. The Samsung Galaxy Note 8 will be larger than the Samsung Galaxy S8 and S8 Plus. The device shares a lot design with the current flagships. The device has a 6.2-inch dual-curved edge 'infinity' display. The dimensions are 160 x 75 x 8.5 mm. The phone will have a back panel protected, jsut like the front panel, with the Corning Gorilla Glass 5. The power and volume buttons reside on the side of the panel, with another dedicated button on the other side of the panel. This button will be to quickly access Bixby. The fingerprint sensor is on the rear panel, just like the S8. Also, on the rear panel, sits a dual-lens camera system, along with a dual-tone LED flash. On the front panel, there is the 6.2-inch super AMOLED display. The display of the phone is a 6.3-inch dual curved-edge 'infinity' display, incorporated by the company in the Samsung Galaxy S8 and S8 Plus. The display has QHD+ (1440 x 2960 pixels) screen resolution and corresponds to approximately 552 pixels per inch along with 16 million colours. The display will be protected by Corning Gorilla Glass 5. All this setup gives the phone great looks and durability. The Samsung Galaxy Note 8 runs on Exynos 8895 Octa-Core chipset for global version and the Qualcomm Snapdragon 835 Octa-Core SoC chipset for the US and China versions. For the graphics part, there's the Adreno 540 GPU, for amazing video playback and an immersive gaming experience. It will run with 6 GB of RAM and will have 64GB of internal memory. There is a dedicated microSD card slot as well, which will allow for expansion by up to 256 GB. Under the hood, the phone's software part will be handled by Android v7.1.1 Nougat based Grace UI. The Note 8 will receive daydream and Android 8.0 updates soon. The phone is a powerhouse when it comes to performance. The SnapDragon 835 is the best chipset in the world and is famous for its cutting edge performance and Quick Charge 4.0 technology, which charges the device in no time. The phone is wireless fast charging compatible too, but the wireless charger will have to be purchased separately. The phone's 6GB RAM leave no scope for any issues in multi-tasking. Also, with 64GB of internal memory, there will virtually be no need to install a microSD card on the device. The Octa-Core chipset, coupled with the Adreno 540 GPU, will ensure the performance of the device never falls. So much power will make the Samsung Galaxy Note 8 the most powerful smartphone in the world. There is another awesome feature that Samsung has incorporated in the Galaxy Note 8. The Bixby Quick Commands, where in the user can set up a series of tasks for the phone to do on just a few words. For example, you say "good night" and the phone will immediately switch to DND mode, turn the bluelight filter on, set the alarm for the next day etc. This feature has been incorporated for the first time in Note 8 and will soon be available to the otehr Bixby compatible devices too. The Samsung Galaxy Note 8 camera is the first ever from Samsung to come up a dual-lens camera system on the rear panel. The rear panel will have a 12MP f/1.7 + 12MP f/2.4 dual-lens camera system with dual-OIS, PDAF system and 2x optical zoom. The camera breaks all barriers and will make an example for others to follow. Samsung claims that the Galaxy Note 8 camera is the first in the world to have a dual-OIS system in it. Samsung's flagship devices always have been the best in the industry, which includes cameras. The camera is capable of taking ultra HD photos, and will be equipped with features such as geo-tagging, panorama, HDR, live focus mode etc. The front camera will be an 8MP AF camera with an f/1.7" lens, capable of dual-video calls and high-resolution imaging. The phone will not be ditching the 3.5mm multimedia jack, like the iPhone. Samsung tends to insist on utility factor instead of fancy features. So the phone will surely be chargeable while you listen to songs. As far as support for multimedia is concerned the Note 8 supports all popular audio formats (AAC, WAV, MP3, MIDI) and video formats (WMV, AVI, MP4) etc. As it seems obvious, a device of such size with such huge display, will definitely need a big battery as well. The device comes with a non-removable Li-ion 3300 mAh battery. The backup will also be pretty good. Given the results of other phones, we may expect the phone to last the day on moderate usage. The battery capacity has been kept down keeping safety factor in thoughts. The phone accepts nano-SIMs, and will support all 4G LTE/VoLTE, 3G HSPA/UMTS and 2G EDGE/GPRS network bands for cellular connectivity. Other connectivity options it offers are Wi-Fi 802.11 a/ac/b/g/n, dual-band (2.4GHz - 5GHz), Wi-Fi Direct, hotspot, DLNA; Bluetooth v4.0, A2DP; GPS, with A-GPS, GLONASS; and Infrared. ALthough there have been no announcements on NFC, the option may very well be there. The phone is surely a majestic looking device. But there are some shortcomings to every device. It can connect to 4G LTE conforming to VoLTE networks. It has support of 3G HSPA/UMTS and 2G EDGE/GPRS cellular networks. Apart from that the phone can connect to wireless networks compliant to IEEE 802.11 a/b/g/n/ ac networks. The device comes in 2 SIM variants i.e Single version includes a nano SIM and a microSD slot, whereas the Dual version includes a nano SIM and a hybrid slot(either a microSD or a nano SIM). Does the device have Gorilla Glass protection? The Corning Gorilla Glass 5 is there for protection with 2.5D curved glass design. How many internal storage variants does the phone come with? The device has been launched in 3 memory options i.e 64GB, 128GB, and 256GB, all equipped with 6GB LPDDR4 RAM. There is a microSD card option to expand the storage up to an additional 256GB. What are the sensors present in the device? The sensors of Note 8 are: Iris sensor, Pressure sensor, Accelerometer, Barometer, Fingerprint sensor, Gyro sensor, Geomagnetic sensor, Hall sensor, HR sensor, Proximity sensor, and RGB light sensor. Is there support of Bixby button? Yes. The Note 8 has a dedicated bixby button that makes your life easier and allows you to do things quickly with an all new personal voice assistance. What miscellaneous connectivity options does it have? The connectivity options present in the device are Wi-Fi 802.11 a/b/g/n/ ac (2.4/5GHz), Wi-Fi hotspot, Bluetooth v5.0, USB-Type C, Near Field Communications (NFC), GPS, Galileo and VoLTE support too. What OS is present in the phone? Will it receive OTA updates? The device runs on the latest Android v7.1.1 Nougat based Grace UI. Yes. it will receive an update to the latest Android OS, ‘Android v8.0 Oreo’ in coming months. What is the device’s battery capacity? It is backed by 3300 mAh battery capacity which is lesser than its predecessor model. Samsung also did 8-point safety check to test its battery quality. The device provides the talk time up to 22 hrs, 14 hrs of internal usage on WiFi, 13 hrs of internet usage on 4G. The device is secure with six authentication features like Iris Scanner, Fingerprint Scanner, Face Recognition for ‘Biometrics lock type’ security, and pattern, PIN, password for ‘Lock type’ security. Does it have fast-charging support? Yes. It does support fast charging, both wireless and wired type. The Galaxy Note 8 comes with a bezel-less edge-to-edge display of 6.3-inches with an aspect ratio of 18:5:9. It has a Quad HD+ Super AMOLED screen type with 2.5D glass material. How many pixels does the primary camera have? Does it have Dual primary-cameras? Talking about the primary camera specifications of Galaxy Note 8, it features the first Dual cameras from Samsung. On the back panel, the main lens has a 12MP sensor with an f/1.7 aperture wide angle lens, while the secondary lens has a 12MP sensor with f/2.4 aperture telephoto lens. The Galaxy Note 8 is the first ever phone to feature Dual OIS (Optical Image Stabilization) and 2x optical zoom. What are the front camera specifications? The front camera 8MP an AF camera with f/1.7 aperture lens for sharp, wide selfies. Are the Galaxy Note 8 and its S-Pen water/dustproof? Yes. Both are IP68 certified; That means you can submerge them in water up to a depth of 1.5 metres for 30 minutes. What are key features of this device? The best features of Note 8 are the infinity display, curved design, two rear-cameras, new and improved S-Pen, bixby assistant and a powerful processor. Which chipset and processor will this device come up with? The SoC(chipset) is powered by the Qualcomm Snapdragon 835 octa-core processor clocked at 2.35 GHz. What are the colour options for the device? There are 4 beautiful colour options to choose from: Midnight Black, Maple Gold, Orchid Grey, Deep sea Blue. At what price Galaxy Note 8 has been launched? Samsung launched the Galaxy Note 8 at a pre-order price of 3399 AED in Dubai, UAE. How to pre-order Note 8 in Dubai, UAE? The device is open for pre-order registrations on various online stores like Sharaf DG, Axiom Telecom, Souq, Jumbo in Dubai, UAE.